There are 4 reviews of Brutus. Absolutely beautiful scent. Comparisons to Black Afgano are unwarranted. More delicate and nuansed fragrance with perfect balance of gritty, dark, with sweet and spicy. Luxe. Spicy. Wood but not dry sawdust. On the bulls-eye for this category. Musky but not animal. Refined without being too round and lacking in angles and definite scent. I want to put a lot of this on; do not think it is in danger of being overpowering. I would wear this to the office day after day. If I got invited somewhere really up/noble/even stuffy, I would reach for this. Yes -- not a normal type 'Nasomatto' unlike Boccanera from the same line. You'd thing 'Brutus' would be an out and out 'masculine' but it's really quite sweet and restrained. Deadidol has listed a lot of notes that I don't detect at all -- cumin? patchouli? -- what I do get is a 'tropical' fruity type orange blossom with a sweet musky finish. However, there is something unidentifiably woody in the base which keeps it very non-fem. I like it very much, with one caveat -- it doesn't smell as expensive as it actually costs. 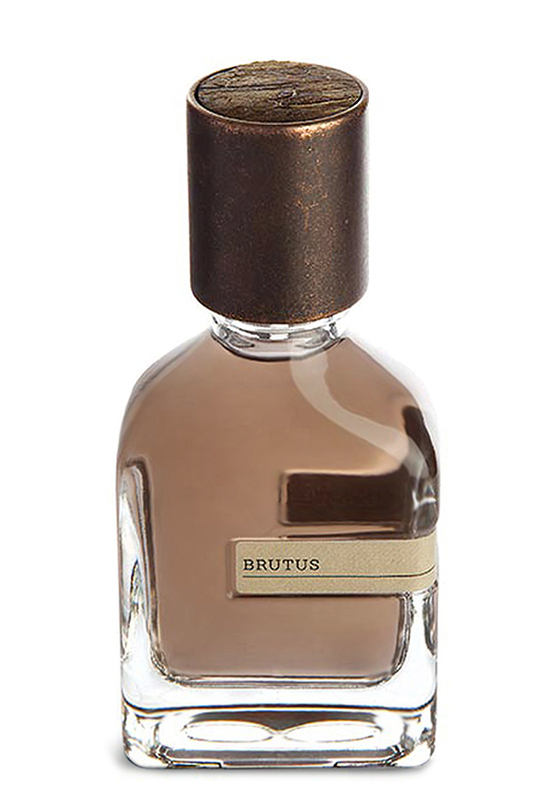 Brutus marks a minor departure from the Black Afgano-wannabe club of other scents in the line, but not by much. This one is more herbal and earthy, but it’s not truly “green” like Viridine. Instead, it’s more musty and desert-like, but it also contains a marked floral juxtaposition that adds some interest. Up front: cumin alert! (So be warned all of you who find the note skeery.) While the cumin’s not as forceful as other scents that feature it, it’s definitely there and plays a little of the botanical musk / sweaty role that it’s most commonly associated with. Beneath this, the scent is basically a vaguely herbal affair over tedious patchouli. The afore-mentioned floral intervention strikes me as tuberose, but it’s both tamed and quite dry. There’s something fruit-esque upfront, yet it’s a mystery to me as to what it’s supposed to be. It’s not citrus; it smells clean and slightly tropical—like something from a can. A musty thread weaves throughout the whole thing, and as it heads into the last phase, it starts to turn (yes, you guessed it) sweet. It doesn’t have Gualtieri’s infamous sour synthetic sandalwood cocktail thing going on, but it does seem to deploy a number of sweet musk materials such as cetalox or ambroxan. It’s as inarticulate and vulgar as the rest of the line, yet it somehow manages to keep itself on the “enjoyable” side of the fence, but you can tell that it’s just a few notches away from complete disaster. There are no member images of Brutus yet. Why not be the first?